Volkswagens have remained one of the most reliable brands in the automotive industry for decades. They’re one of the most widely purchased vehicles globally because they’re designed to be durable and reliable, but they still run into problems from time to time. More specifically, Volkswagens commonly experience issues such as premature brake wear that can significantly affect drivers’ safety. If you drive a VW, don’t panic yet—this issue doesn’t commonly affect all Volkswagen models. The Volkswagen Touareg, model years 2004-2011 are the most-affected vehicles. In this article, we’ll go over how you can recognize brake pad and rotor problems, possible reasons for premature wear, and what you can do going forward to stay on top of the issue, aside from selling your car. 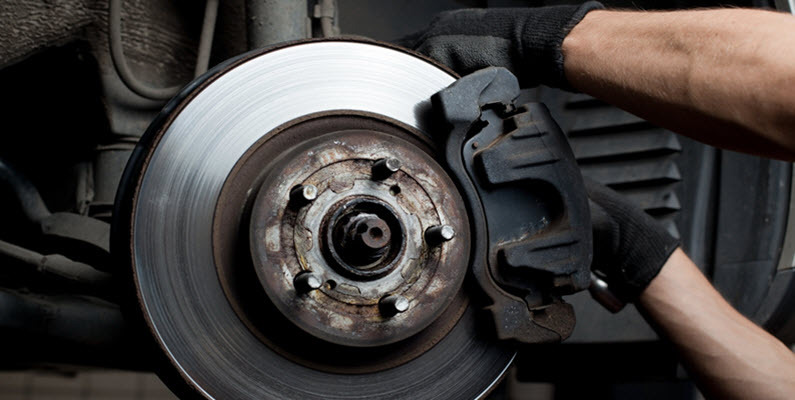 Brake wear is normal, and it’s common to have to replace brake pads or rotors intermittently over time. There are signs that you should continually be on the lookout for when it comes to brake functioning to ensure your safety at all times. Some of the most common signs of brake pad or rotor wear include: odd noises when applying the brakes; intense vibration in the brake pedal; decreased brake responsiveness; and visible wear to the brake pads. A good rule of thumb is to have your brakes inspected every time you have your tires serviced or rotated—as it’s most efficient to inspect the brakes thoroughly when the tires are off the car. The Volkswagen manufacturer has yet to acknowledge any fault in their brake design or engineering; however, VW drivers continue to report premature wear in their brake pads and rotors—an expensive repair when necessary at more frequent intervals. These are the possible reasons for premature brake wear in general, and they may or may not apply to your specific VW model or year. While we’re certainly not suggesting you’re doing anything wrong, individual driving habits and conditions are the most common causes of premature brake wear. It might help to objectively observe your own braking habits in your VW—if you notice that you spend a lot of time in stop-and-go traffic, traveling long distances downhill, or applying the brakes hard and fast, you might want to try taking another route or going easier on your brakes to see if this makes any difference. Depending on who you choose to service your VW’s brakes, they might not be performing their job correctly. Using inadequate brake pads can lead to quick wear that will eventually translate into premature rotor wear. Furthermore, if brake pads are not properly applied or aligned, they can wear unevenly causing significant brake performance issues over time. Normally brakes need to be serviced between the 50,000-1000,000 mile mark, but it’s common for VW Touareg models to require replacements sooner—nearly 10,000 miles earlier. This is problematic for drivers, but as we’ve mentioned the manufacturer has not acknowledge any fault in their engineering or design. Since this seems to simply be a problem with these VW models, it’s especially important to stay on top of brake maintenance procedures to avoid brake failure or risks to your safety. Following your schedule of maintenance can help keep your brakes in optimal condition, but in this case it’s important to consult with a Volkswagen specialist who can anticipate premature brake wear and act accordingly. The Volkswagen pros here at European Motor Cars have provided quality automotive servicing and repair for the residents of Summerlin, Spring Valley, and Las Vegas, NV for over 3 decades. Our vast experience and skill in working with German vehicles such as Volkswagen has given us the opportunity to promote the safety of families and individuals in our communities with accuracy and efficiency. We act preventively in our approach to automotive care, which is what makes us reliable, consistent, and affordable, saving our clients money in extensive repair work down the line. If you’ve begun to notice any concerning issues related to your VW’s brakes, please don’t hesitate to bring it in to us for an inspection—ensuring your safety is our number one priority. * Volkswagen Cars at Service Center image credit goes to: jetcityimage.